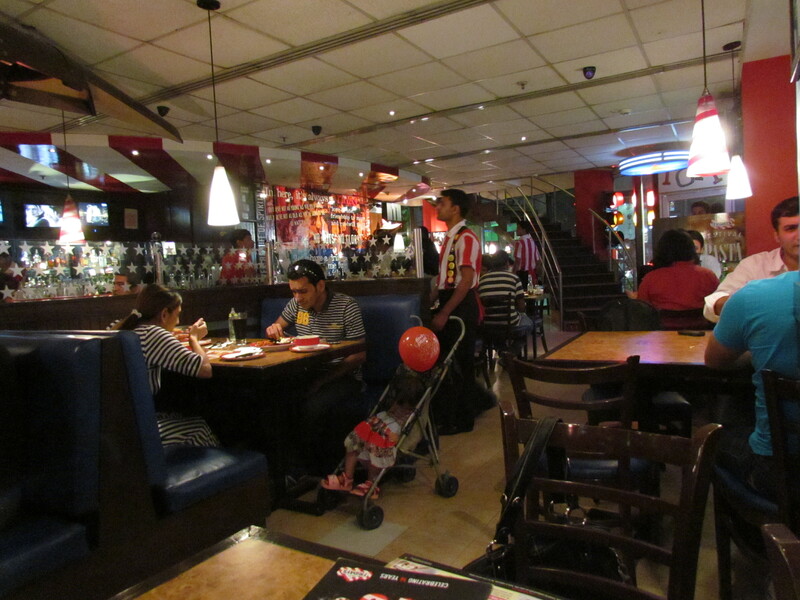 I was quite impressed with the Mexican Section at TGIF – in addition to some of my usual American favourites. Unfortunately there r not too many stand-alone Mexican Restaurants in Gurgaon who serve Great Mexican food & most of those Restaurants have very chicken heavy menu. 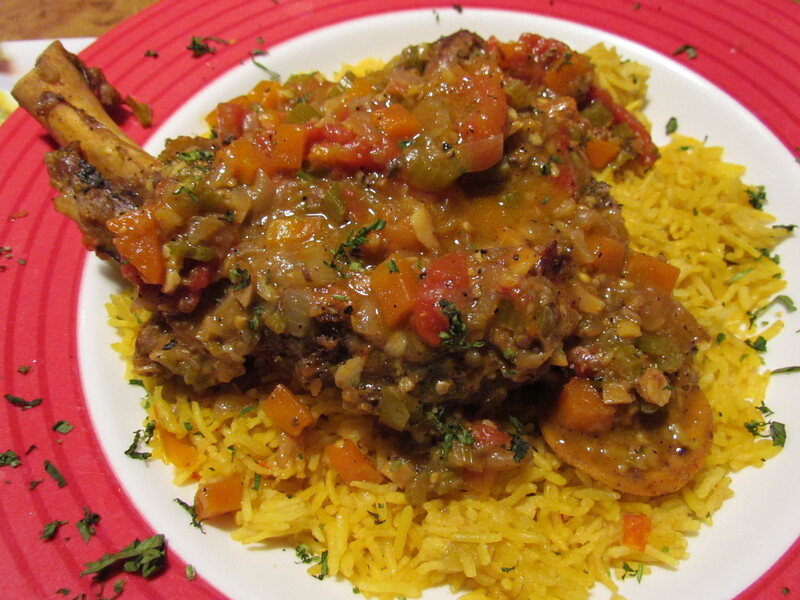 For Lamb, pork & beef lovers, TGIF is a welcome relief. Note: pls click on this link to see more pics of food here. We reached ‘Thank God its Friday’ (TGIF) on a saturday to have some great mexican food – wondered why I never tried this before – closest to ‘the real thing’ (original Mexican food), sitting here in Gurgaon – closest but shades below. 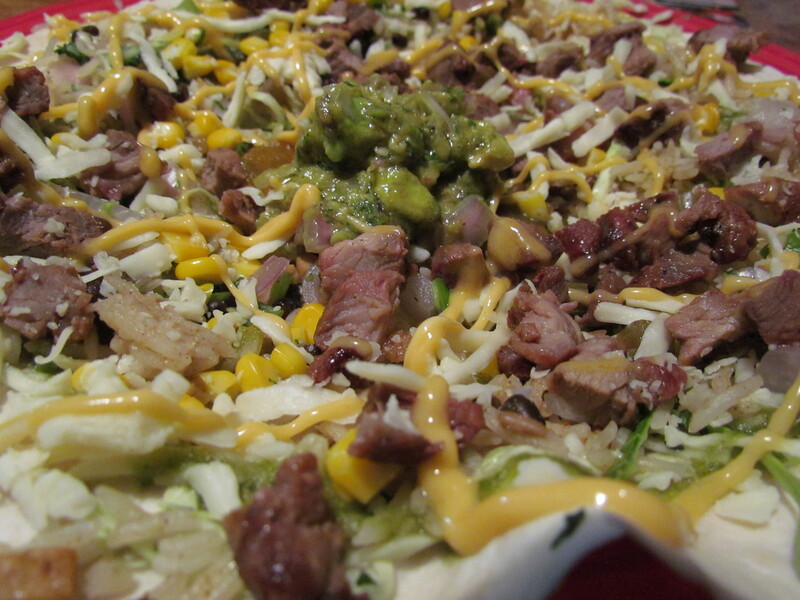 Quite a few Standalone Mexican Speciality Restaurants serve much better stuff in the USA – My top of the mind recollection being Mi Amigo’s Arizona. TGIF is a well known Restaurant chain. So I do not need to talk much about it. I love the shirts worn by serving staff & the numerous badges worn by them & also the little detail spread all over – including inverted boats hanging from the ceiling. My usual favourites are the starter platter, steaks, pork ribs, burgers, chicken wings & of course the mammoth but YUMM dessert options. 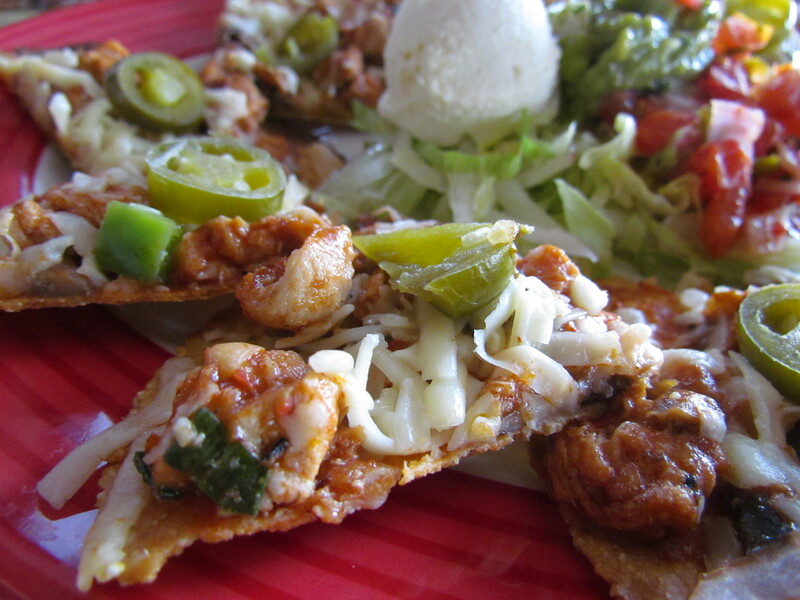 As mentioned above, this time around we tried the Mexican section & loved it. We tried the Burrito bowl – It was flavourful rice with sausages, layers of Black beans, marinated lamb steak & pickled onion slaw. 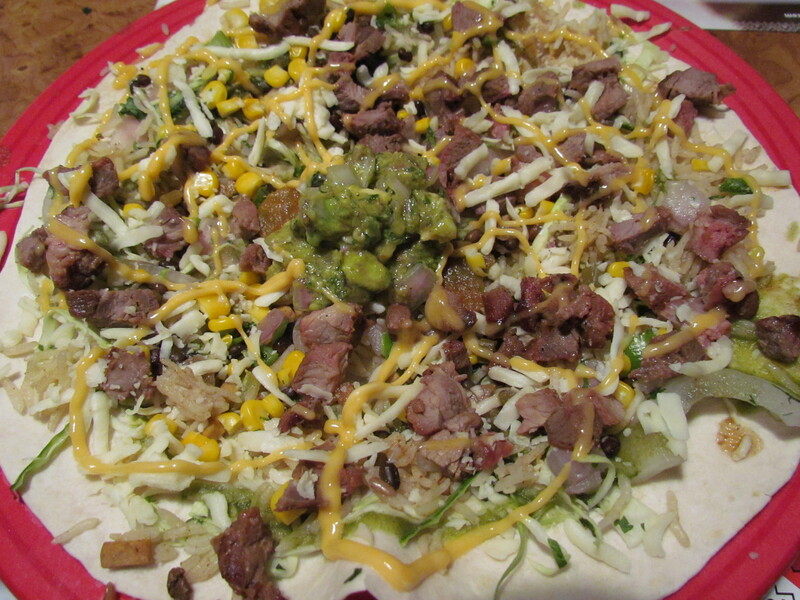 It was then topped with freshly made Picco de Gallo, shredded Montery Jack Cheese & cilantro served on a warm tortilla. The sausages were chopped as per practice. So we cud not njoy the experience of biting into a sausage & the juices bursting into the mouth. The chopped sausages were very good to taste. Picco de Gallo was pretty interesting too. The tortilla being warm & super soft added to the wow experience. Loved this dish. I wud say 4/5. Then we tried Tex Mex Spicy braised lamb. It was lamb slowly simmered to perfect tenderness in ginger, garlic, chilli pepper, spices, along with white wine, carrots, celery & onions. Served over creole rice, chicken sausages & topped with flavourful rich ‘roasting sauce’, it was a gem of a dish – sooooooooooooper soft & too tasty too. I have seldom come across (except Lucknowi Dum cooking) meat that is so soft, tender, melt in the mouth & awesome tasty at the same time. Mindblowing good. I wud give this dish 4.75/5. We chose to eat Sirloin steak & requested for medium done. What came was medium rare done. Instead of telling us that there has been a mistake, the guy came & asked – ‘Pls chk & tell me if the steak is correctly done’. I cut & ate from a corner & found it a bit rare but said OK. Only when I reached the middle of the steak that I realized it was medium rare – coz corners r usually thinner & better done than the thicker center. It was a 12 oz steak, seasoned & fire grilled. 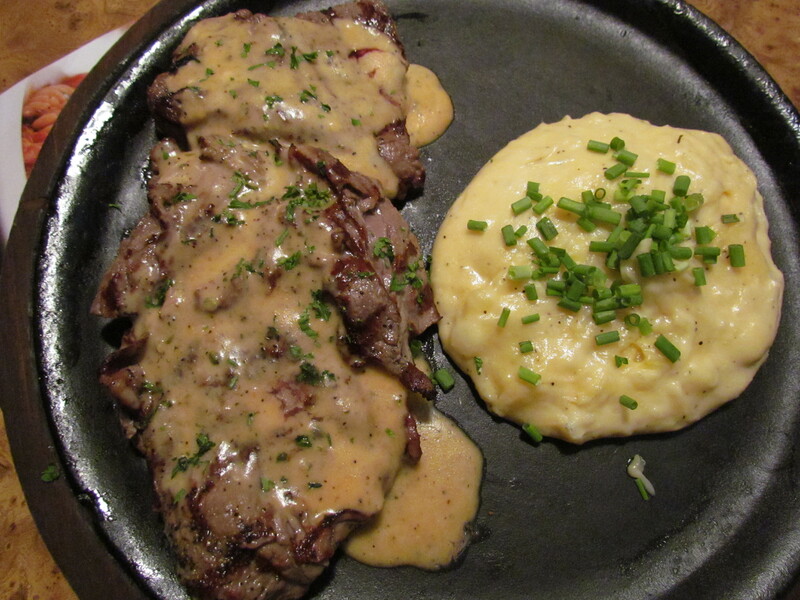 We customized it with butter wild mushroom sauce & had cheddar mashed potatoes on the side. Liked the steak inspite of it not being done the way requested. The Mushroom butter sauce turned out to be creamy & YUMM. Mashed potato with Cheddar cheese was a treat as well. I wud give this dish 3.75/5. 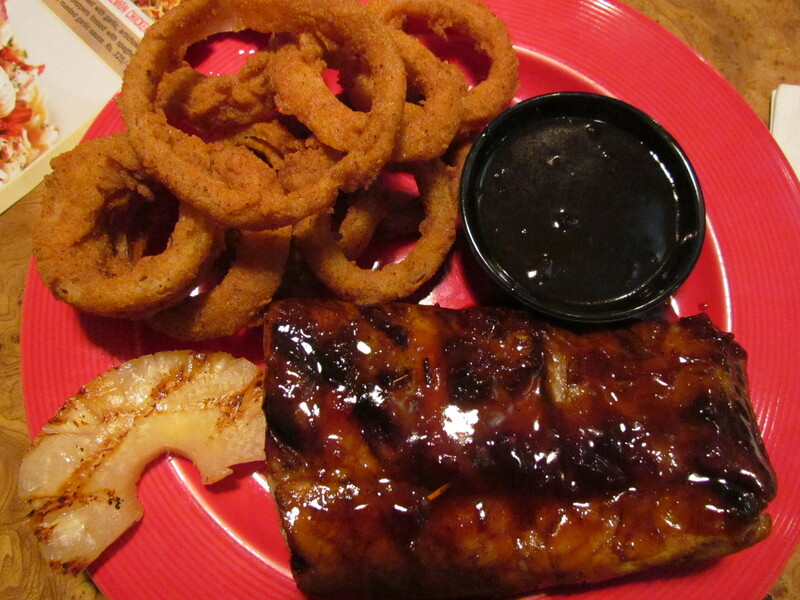 Next we had Spicy Jack Glazed Ribs – It was ‘imported’ pork back ribs chargrilled & basted with Special Spicy Jack Glaze. The meat is supposed to b super soft but it was’nt. It pretty much stuck to the bones & it was quite a task to rip off the flesh from the bone using my teeth – with the potential of a vegetarian onlooker mistaking me for a caveman!!!!! With such a low on texture, the taste was superb. I love the Jack Glaze – Strong taste & flavour. U might dislike if u r used to subtle tastes & flavours. I wud give this 2/5 for texture & 4/5 for taste thus summing up to an average of 3/5 for the dish. This was served with awesome Crispy Cajun onion rings. Its not easy to make a simple onion ring so tasty. I enjoyed those as it is & also with the dark brown Jack Daniel dip. 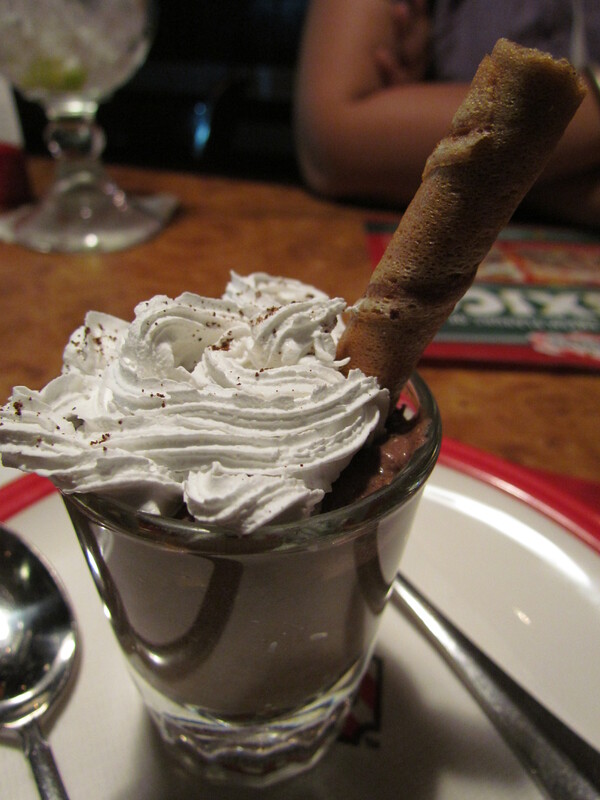 We loved our little dessert served in a shot glass. This time around we decide to pick up one item for snack & a non alcoholic beverage. 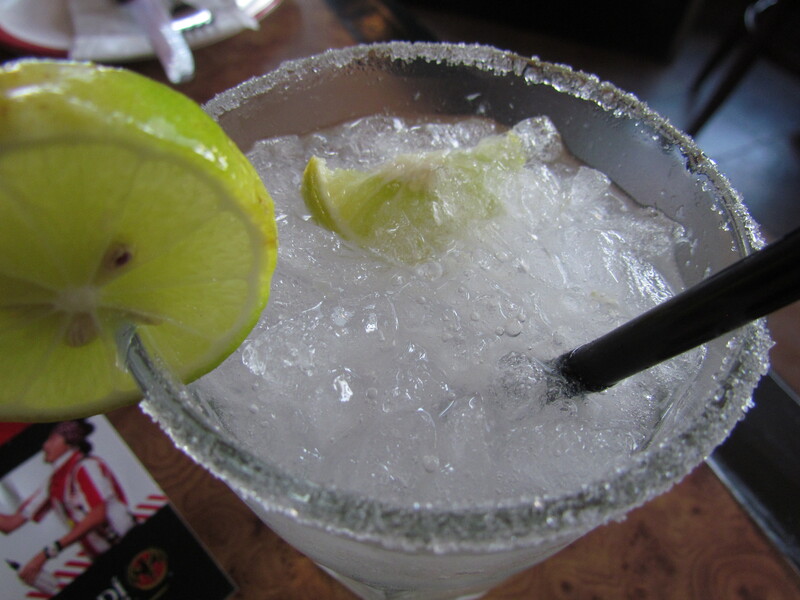 So we asked for a lemonade (fresh lime soda). What turned up was quite a dissappointment when I compare it to my previous TGIF experiences but better than many others. 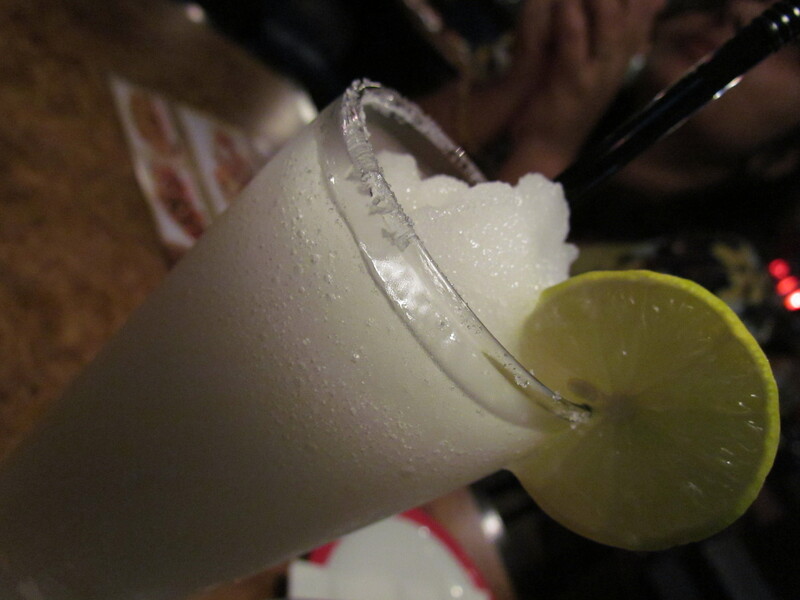 What they had ended up doin was that the lemon was not properly crushed – so it was a bit too sweet. For snack we ordered spicy chicken nachos. Liked it quite a bit. 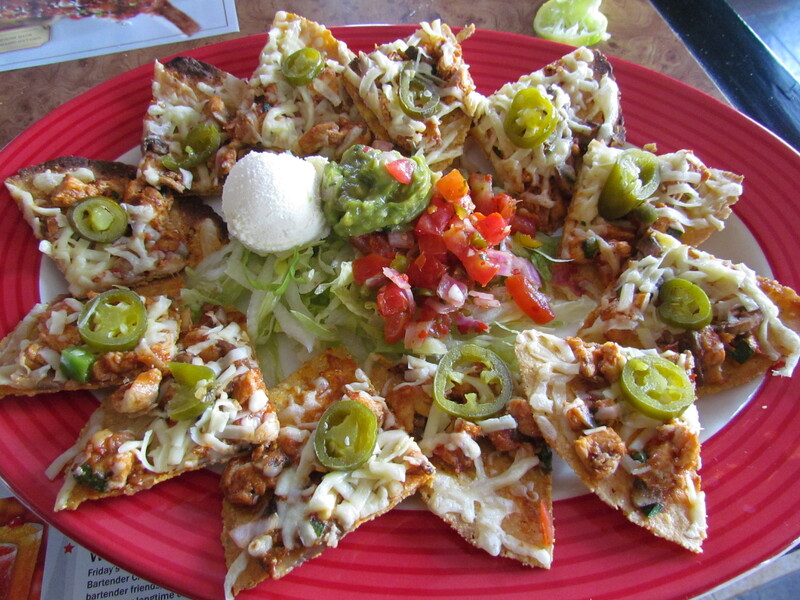 Thankfully the nachos were crisp & good unlike n most places in India. Chicken pieces were very njoyable as well. Jalapenos added the zing. I wud rate it at 3.5/5. 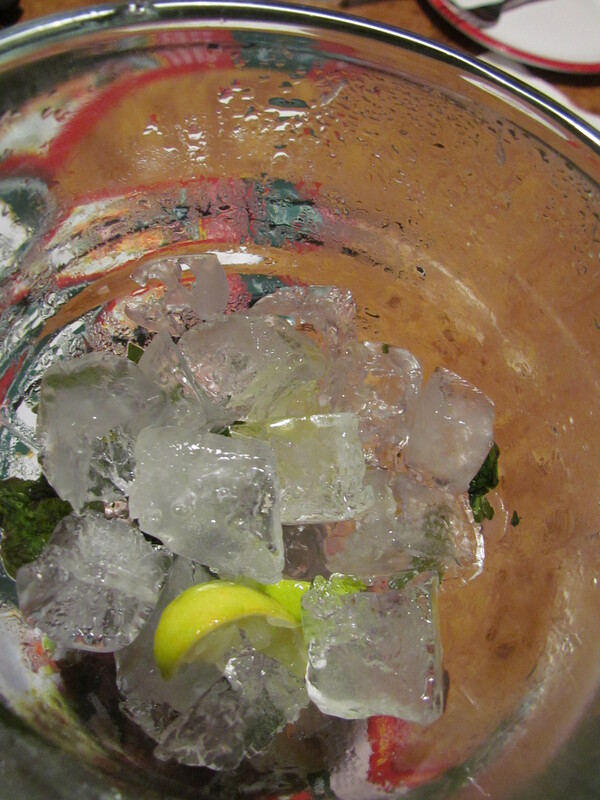 Overall: Like always I will keep visiting this place when in mood for some American / Mexican food with Ultimate Mojito.